Now that the turbulence surrounding the 2004 presidential election has abated, it is critical to revisit a question that deeply divided both the Catholic bishops and the Catholic laity during the heated months of summer: Should Catholic public officials who endorse the continued legalization of abortion be ineligible to receive the Eucharist? This issue will not go away. If ignored, it will merely simmer until the next cycle of national elections, when it will emerge in the same volatile, divisive and unfocused manner that characterized the debate of 2004. Whether or not the leadership of the church in the United States chooses to resolve this explosive issue during the relative calm of the next two years will have immense implications for Catholicism’s future as a voice for justice within the American political system. The issue of eucharistic sanctions holds within it a unique symbolic power to mold the image of the church in the public square for decades to come. The theological starting point for those who advocate eucharistic sanctions is a sound one: the continuing support of Catholic political leaders and voters for abortion rights is a scandal in the life of the American church. No nuances in the relationship between legislator and constituent, no recognition of the mediating institutional questions lying between the act of abortion and specific legislative formulations can eradicate the fact that political action designed to retain or expand current abortion rights is morally unacceptable. The continuing decision of American Catholic politicians and voters to contravene the tenets of their faith is a major failure in church life. That some Catholics, who claim to believe what the Church believes, are willing to allow others to continue directly to kill the innocent is a grave scandal. The situation is much much worse when these same leaders receive the Eucharist when they are not objectively in communion with Christ and His Church. Their objective dishonesty serves to compound the scandal. As a consequence, the advocates of sanctions argue, Catholic political leaders and voters who depart from the church’s teaching on abortion are automatically deprived of the right to receive the Eucharist. But the sanctions camp’s interpretation of the church’s theology of the Eucharist provokes many questions. First of all, it casts aside all the limitations and admonitions to pastoral solicitude that the church has traditionally demanded in cases of denial of the Eucharist. Second, since the sacramental theology being advanced provides for a separation from the Eucharist whenever believers have abandoned the fullness of Catholic faith, it seems likely that the number of teachings to which adherence is deemed mandatory for eucharistic eligibility will proliferate. Indeed, during the debate in 2004 on eucharistic sanctions the number of issues classified as leading to automatic unworthiness for the Eucharist in some dioceses of the United States grew to include euthanasia, cloning and the nature of marriage, in addition to abortion. Third, it is manifestly unclear in this new eucharistic theology what level of action is necessary to activate the penalty of eucharistic sanctions. Legislative action for positions contravening major church teachings? Voting for a candidate who opposes church teachings? Statements by citizens in public discussions? Finally, the sanctions position ignores the fact that Pope John Paul II has on many occasions given Communion to political leaders he knew were in favor of the legalization of abortion. But the most significant question that must be put to those who wish to impose eucharistic sanctions for political action in the United States is this: Why, when dealing with a pastoral situation that they have clearly defined as a case of scandal in the life of the church, have they chosen to amend the church’s mainstream eucharistic practices rather than turn to the church’s traditional theology of scandal? Prudence is the virtue that disposes practical reason to discern our true good in every circumstance and to choose the right means of achieving it. It is not to be confused with timidity or fear, nor with duplicity or dissimulation. It is called auriga virtutum, the charioteer of the virtues; it guides the other virtues by setting rule and measure. With the help of this virtue we apply moral principles to particular cases without error and overcome doubts about the good to achieve and the evil to avoid. The virtues of the Christian life—such as faith, hope, love, zeal, compassion, generosity, fortitude and patience—are all magnificent qualities of the heart and soul, but any one of them in isolation can be taken to excess and thus yield actions that in the end are harmful. Prudence is the balancing virtue that gives each virtuous impulse its due in selecting the right course of action. It is thus particularly critical in delicate judgments like those called for in cases of scandal. The criterion of prudence requires that the advantages and perils of implementing eucharistic sanctions be carefully weighed in the concrete situation. The primary benefit of imposing eucharistic sanctions is that they will point to the absolute central position abortion occupies in the church’s quest for justice in the social order in America today. Sanctions will function as a moral call to arms, by which individual Catholics will be forced to choose whether they value more their Catholic faith or the political/philosophical commitments that tie them to political action supporting abortion. The denial of the Eucharist will say in a unique manner that the church cannot continue to be a house divided any longer, half pro-life and half pro-choice. 1. The denial of the Eucharist to political leaders who support abortion legislation will inevitably be perceived by Americans, Catholic and non-Catholic alike, as coercive. The church has presented itself to American society as a witness to the values of the Gospel in the social order, seeking to convert minds and hearts to defend the dignity of the human person. Eucharistic sanctions will be seen as a repudiation of this role in the public square and the adoption of a radically new stance based upon the coercion of minds rather than the conversion of minds. It does not matter that eucharistic sanctions would be fully within the legitimate moral and civil rights of the church to adopt, and that those who have attacked them as a violation of the separation of church and state are totally in error in their understanding of the constitutional tradition of the United States. What does matter enormously is that Americans will in general recoil from the use of the Eucharist as a political weapon, and will reassess their overall opinion of the church’s role in the political order. Not only will sanctions not increase support for pro-life legislation; they will also undermine support for the church’s entire effort to bring Gospel values to the structures and policies of American government and society. 2. Eucharistic sanctions will further identify abortion as a sectarian Catholic issue and thus play into the hands of those who falsely accuse the pro-life movement of imposing specifically religious tenets upon the American people. One of the most damaging and mistaken charges leveled against pro-life political leaders and groups is the assertion that the commitment to protect human life from the moment of conception is a specifically religious principle and should not be enshrined in law in a religiously free society. The pro-life movement has worked arduously to refute this assertion and to build a coalition that crosses religious boundaries, embracing men and women of all religions and no religion. The imposition of eucharistic sanctions will cripple this effort. 3. The use of eucharistic sanctions for political action will inevitably breed a reductionist outlook in defining the church’s social agenda. One of the greatest strengths of the church’s teaching in the social and political orders has been the breadth of vision the Catholic tradition brings to the monumental problems of our times. Repeatedly, the church has refused to countenance any effort to reduce this social teaching to fit categories imposed by particular political systems or structures. In its Doctrinal Note on Some Questions Regarding the Participation of Catholics in Political Life (November 2002), the Congregation for the Doctrine of the Faith powerfully attested to the full spectrum of these moral imperatives for Catholics. Yet the sanctions movement has already made clear that it advances a two-tier notion of political imperatives for Catholics, one that centers upon life issues and another for all other political and social questions. The life issues will be deemed essential to the fullness of Catholic faith and thus to participation in the Eucharist; all other issues–including war and issues of economic justice, over which the United States exercises unparalleled influence because of its political and economic power—will be relegated to secondary status. 4. The imposition of eucharistic sanctions will cast the church as a partisan actor in the American political system. One of the great tragedies of American politics in the present day is that the Democratic and Republican parties have evolved in a way that makes it virtually impossible for candidates who follow Catholic social teaching in its major elements to win party primaries and thus to be elected to office. In the main, this means that Republican political leaders in the United States are more reflective of the church’s stance on abortion, euthanasia, cloning and marriage, while Democratic political leaders are more likely to reflect Catholic values on issues pertaining to war and peace, the poor, the death penalty and the environment. Such a schism in our political culture places Catholic voters who wish to follow church teaching in a very difficult position. The United States Conference of Catholic Bishops has handled this dilemma by emphasizing the importance of the wide spectrum of critical social issues, while simultaneously pointing to the particularly critical role that abortion has in the present day. 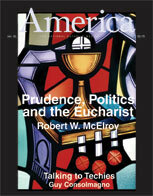 The imposition of eucharistic sanctions solely on candidates who support abortion legislation will inevitably transform the church in the United States, in the minds of many, into a partisan, Republican-oriented institution and thus sacrifice the role that the church has played almost alone in American society in advocating a moral agenda that transcends the political divide. In the wake of the bitter and partisan campaign we have recently endured and the divisions within the church that it inflamed, it is tempting to let the question of eucharistic sanctions lie dormant in the months ahead. But in this matter we can learn from a piece of wisdom that political leaders of all views endorse: it is far easier to face truly divisive policy questions before the advent of a new political season than in the heat of an impending election. The leadership of the church in the United States will best serve the Catholic community if it achieves consensus on this critically important public policy question soon, and if it roots that consensus firmly in the ancient theological tradition of prudence as virtue’s charioteer. I found this article very helpful in understanding the "scandal" arguments advanced by my elders; however, I was most disappointed that none of the considerations important to me were included in the article. Commissioned to be a light to the world, Christians often must choose the more difficult, narrow path. How easy it is to display beautiful pictures of fetuses and damn God's temples who conceived them! How much more difficult it is to look in their faces and see fearful women facing difficult decisions. The Koran treats these sinners much more lovingly, enjoining them not to murder their children "from fear of poverty." Abortion is a grave sin. The argument about making abortion illegal, however, is not about morality. The argument is about who we will throw in prison. Should we again make abortion illegal, we are choosing to throw a lot of poor women into prison. Any other children they have will be raised without a mother. The rich gals will just go back to getting their "little D&C's" like they did in the old days. Compassion for the poor is also a Christian mandate. Abortion is a grave sin. There are other grave sins, including men who objectify women, those who forcibly father children upon them, those who steal the innocence of young girls, and those who encourage women to act according to male reproductive straategies contrary to their feminine biological nature. If only the emotional response engendered by those cute little pictures could be similarly aroused by the plight of victimized women! Whenever the Spirit is particularly active in the world, the madonna weeps and innocents die. We have been blessed with an understanding and a worldview that we are commanded to bring to the world. I thought I heard someone say sometime that he did not come to bring condemnation. Let us pray that we may more closely follow His example. I read with appreciation Msgr. McElroy's wise (and "prudent") article about the imposition of Eucharistic sanctions. In his list of unintended consequences, he focuses on the impact of such sanctions on the church's prophetic role in public discourse, on the pro-life movement, and on the church's ability to speak (or to be heard) on the entire range of social justice issues that demand its attention. I would add to his list the impact such sanctions may have on our understanding of the Eucharist itself. The Eucharist is a gift: one that none of us deserves but that all of us need. Imposing sanctions around such a gift may seem to reduce it to a "perk" of paid-up membership, or worse, to something we could presume to earn, or to deserve. As Bishop John F. Kinney of St. Cloud wrote to his people in a profoundly pastoral letter last May, the prayer we all say as part of the Communion Rite is "'Oh Lord, I am not worthy.' It does not say, 'Oh Lord, my neighbor is not worthy.'" If we truly believe in the transformative power of the overwhelming gift of the Eucharist, we would, it seems to me, be especially eager to join around the table with those we feel most need a change of heart. The Eucharist is not merely a sign of unity; it is a source of unity as well. Imposing sanctions on reception of the Eucharist brings us perilously close to the situation of the one in Luke's gospel, so convinced of his own righteousness that he prayed "'O God, I thank you that I am not like the rest of humanity." We need to remember that Jesus tells us that person went home satisfied, but not justified. I’m pastor of a small parish in western Oregon, and I am appalled at how seriously the narrow decisions of individual bishops have muddied the waters, and confused the faithful, causing a polarization that makes it almost impossible to raise complex questions from he pulpit. Is there adequate dialogue with pastors on these decisions that seriously impact and compromise their ministry? I couldn’t agree more with Robert McElroy’s article "Prudence and Eucharistic Sanctions." But I would like to broaden the perspective of what’s happening, and therefore why the situation will continue to be dicey. When an individual’s very identity is under sustained attack and erosion is taking place, there’s an automatic inner response of acting out the inner trauma, trying to rid oneself of psychological toxins. Institutions at least to some degree imitate this process. I wonder to what extent the Eucharistic sanctions in the political realm are related to the wider assault on the authority of our consecrated leaders from other quarters?. Is it possible that they are acting out these deeper, more serious issues? And if so, why this arena? Perhaps because it is apparently (superficially) safe and shows they really do have power, and will be listened to. If this observation is to any extent correct we may be in for more thunder and lightening than we’d like. History warns us how an apparently harmless cloud on the horizon no larger than a fist can suddenly turn into a tsunami. I fully agree with McElroy that the Eucharistic sanctions issue is charged with dynamite and, unless dealt with before the next national elections “will have immense implications for Catholicism’s future as a voice for justice within the American political system.” And within every parish across America. It seems to me that the mission of the Church is to preach, not to judge. The only judgement for which we are collectively or individually qualified is that of ourselves. Secondarily, let us not lose sight of the fact that abortion is in large part a response to our vicious ostracization of rather than support for unwed mothers. Thanks to Msgr. McElroy for his clear and balanced discussion of Prudence and Eucharistic Sanctions. The fact that many of our Bishops are lacking in prudence has been demonstrated in other areas requiring administrative decisions, not the least of which is their callous disregard of the victims of clergy sexual abuse. As long as church leaders are chosen without consultation with lower clergy and laity and largely on the basis of acquiescence with sexual teachings long rejected by the faithful, prudential judgment is likely to be in short supply. What can one expect from leaders who pass a litmus test for ordination demanding acceptance of the idea that anovulatory drug use is an intrisic evil? Is it not likely that some Catholics, having rejected the notion that masturbation and contraception are intrinsically evil, would extend their conscientios objection (no matter how wrongly) to the abortion teaching? The advocates of eucharistic sanctions are willing to convict all pro-choice Catholics of bad faith. This Catholic is not so willing. Your lead article of 1/31/05 ("Prudence and Eucharistic Sanctions") ought to be required reading for our bishops and an early meeting topic for them. The frequency of abortions in this country is a tragic fact of national life which, as the author states so convincingly, requires a clear response by our bishops solidly based on good theology and so carefully thought out that its effectiveness is practically assured. I fervently hope that this will be the ultimate fruit of the McElroy article. Msgr. McElroy's "Eucharistic Sanctions" (1/31) sets forth very well some important realities regarding denial of the Eucharist to pro-choice political leaders. The "four unintended consequences" he articulates need to be heeded. They are indeed likely consequences for the American church. I wish to make a further point. Those pro-choice political leaders may be guided by the same virtue of prudence--the same concern for unintended consequences recommended by the bishops. Lyndon Johnson wisely observed: "Politics is the art of the possible." We should have learned from the history of Prohibition that there can be serious consequences for the whole society when criminalization is enacted in the absence of a consensus of the populace. Not only was Prohibition ineffectual. It had unintended consequences, including disrespect for law, the strengthing of organized crime, and the corruption of big-city law enforcement. Similar results might be expected for the criminalization of abortion. This does not mean that nothing is to be done about abortion. In spite of polarizing rhetoric, very few Americans are "pro-abortion though a majority are pro-choice. The answer to lowering the abortion rate may well lie in the incipient common ground movement in which pro-life and pro-choice people join together to work against the underlying causes of abortion. Senator Hillary Clinton has just signed on. Others need to follow. Msgr. Robert W. McElroy’s essay, “Prudence and Eucharistic Sanctions” (1/31), is clearly an attack on the moral teaching of the church, and your publishing it is the same. The abortion issue is identical to the “holocaust” in Nazi Germany. It is about murder. To that I ask, So what? Did not Jesus face the same antagonisms? Did he escape from the wrath of the government and of the chief priests? Numbers 2, 3 and 4 in the article pose the same attitude: Be politically correct and escape criticism and persecution. We are going to be persecuted no matter what the church says—by atheists, agnostics, secularists and others who hate us. Loyalty to Jesus is risky; the rewards, however, are more than deserved. I am writing to comment on the article, “Prudence and Eucharistic Sanctions” by Msgr. Robert W. McElroy (1/31). I thoroughly agree that prudence is a necessary virtue to be practiced in making any moral decisions associated with the lives of others. I also agree that great care should be employed in any determination of using the Eucharist as a tool to sanction an outside action. But in pointing out the partisan divisions that make it difficult for a politician to become an elected official, I think that only the symptoms of a greater wrong have been discussed in the article. I refer here to the assumption of a persona by a person who then represents that “person in law” exclusive of his own personal identity. I offer as an example the celebrity who will endorse whatever might pay for the use of the celebrity’s name. But also, consider the corporate C.E.O. who sets aside his personal belief to act for the corporate person, whether the C.E.O. agrees with the morality of the corporate action or not. Is any of this different from the action of a politician who would deny his personal identity to take on a persona of the political majority to act as their representative according to the law of the land? I would therefore say: Yes, let us exercise prudence. But please, treat the illness and bring about a defining determination of the morality of personal identity and responsibility, where it begins and where it ends. Instead of devoting almost half his article, “Prudence and Eucharistic Sanctions” (1/31), to prophesying dire consequences of withholding holy Communion from the likes of John Kerry, Msgr. Robert W. McElroy should have suggested, as do I, that our bishops simply remind their priests and lay eucharistic ministers of their duty, as well as their right, to withhold the sacrament from those who they know (repeat know) “obstinately persist in manifest grave sin” (Canon 915). I prophesy no dire consequences therefrom. In making his case for prudence as a brake on an excessive indulgence in other virtues, Msgr. Robert W. McElroy overlooks the very real danger of an excess of prudence (“Prudence and Eucharistic Sanctions,” 1/31). Indeed, his specific arguments for prudence in denying the Blessed Sacrament to “Catholic” politicians who support abortion-on-demand seem to be based on fear of what others may think. In Sunday school, long ago, we were taught to shun “human respect” in the exercise of our religious duties. The concept may be unfamiliar now. Overlooked in the monsignor’s essay is the obligation to defend against profanation of the sacrament, and—for the good of their souls—to prevent such ambiguous “Catholics” from committing mortal sin. Granted, that obligation may impose demands on one’s reserves of courage. But courage has long been recognized as the mother of all virtues. Without courage, prudence may well decline into pandering, leading to scandal and ending in sacrilege. Perhaps the monsignor will favor us with another essay—on the virtue of fortitude? In his brilliantly argued article, a model of clarity and balance, “Prudence and Eucharistic Sanctions” (1/31), Msgr. Robert W. McElroy identifies the bottom line in the battle over abortion: “seeking to convert minds and hearts to the dignity of the human person.” Lacking such interior conversion, all legal measures in defense of life, however important in themselves, will be of little use. Among the many battles for hearts and minds in our country’s history, the one closest to that over abortion is the pre-Civil War controversy over slavery. In his book A Private Choice (1979), John T. Noonan shows the chilling parallels between the pro-slavery arguments and legal tactics in the 1850’s and those of pro-choice people today. Today we are ashamed of slavery. When abortion becomes as unthinkable for Americans as slavery now is, the battle will have been won. How long that will take, no one can know. What is certain is that whatever delays that day must be rejected. Whatever hastens it must be embraced, even at the cost of alienating courageous champions of the pro-life cause whose zeal sometimes clouds their judgment. This article also appeared in print, under the headline "Prudence and Eucharistic Sanctions," in the January 31, 2005 issue. Msgr. Robert W. McElroy, pastor of St. Gregory’s Parish, San Mateo, Calif., is the author of The Search for an American Public Theology: The Role of John Courtney Murray and Morality and American Foreign Policy: The Role of Ethics in International Affairs.